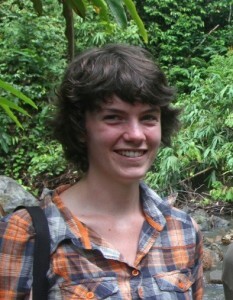 We congratulate Louise Hill on successfully defending her DPhil at the University of Oxford. Louise is the third (and sadly final) Oxford-Sylva scholar. 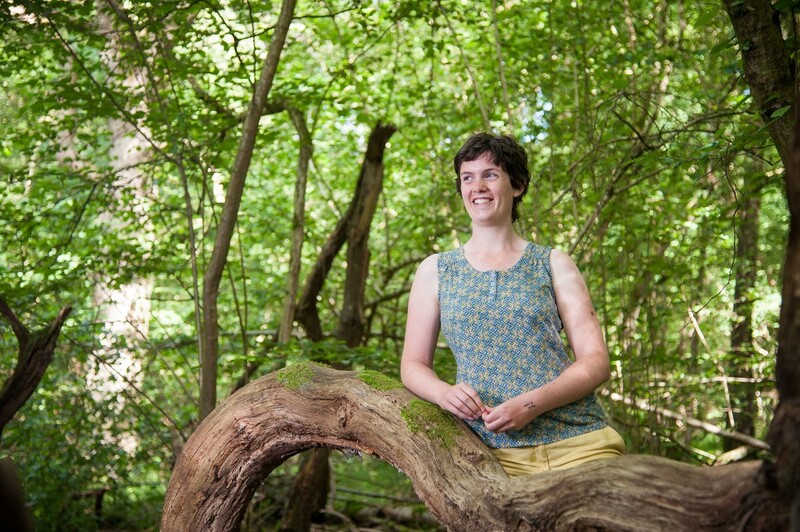 Over the last four years she has been researching the impacts of ash dieback. Here Louise describes in her own words what she has achieved, and what our support has meant to her personally. Well done Louise! It’s been a long road to get here, but four and a half years after starting I have finally finished my DPhil. As the Sylva Scholar, I have been extremely privileged to complete my project at the University of Oxford, with opportunities to meet top scientists, speak at international conferences, and produce the best research that I am capable of. 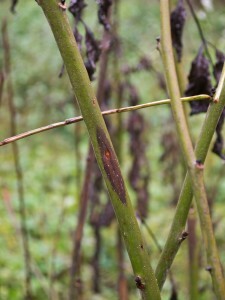 My research project looked at various different aspects of the ash dieback outbreak in Britain. This disease is one of the most important contemporary challenges to the health of our woods and trees. An invasive fungal pathogen (Hymenoscyphus pseudoalbidus) [Ed. formerly known as Chalara fraxinea], it threatens the future of common ash (Fraxinus excelsior) as a dominant tree in Britain. The impacts of this loss will be widespread: over the coming decades we are likely to see significant impacts on the health of woodland and non-woodland ecosystems, on associated biodiversity, and on human health and wellbeing as the benefits of ash trees to society are lost. My project was broad and investigated impacts in many of these areas. I carried out experimental work to clarify the impacts of ash loss on woodland ground flora and invertebrate communities. I modelled the distributions of trees and their associated traits and functions (with a paper published in Ecology and Evolution: http://onlinelibrary.wiley.com/doi/10.1002/ece3.2661/full). This allowed me to investigate the areas and ecosystem types most vulnerable ash loss, and to develop management guidance to help mitigate this loss (paper in review). In my final year, I investigated the economic impacts, an ambitious project which I am now developing further with collaborators at the Woodland Trust and Fera, and which we hope will produce a high-impact publication with political significance. It’s been a lot of hard work, but I have come away with something I feel really proud of: a project that I could make fully my own, that I believe has contributed to both the scientific understanding of the disease and to practical measures to reduce its harm. None of this would have been possible without support and input from the Sylva Foundation: the scholarship gave me a fantastic opportunity, and I have tried my best to make the most of it. This experience culminated a couple of weeks ago in an invitation to attend a Plant Health and Biosecurity conference at Highgrove, contributing directly to ideas for future policy. I hope in the future I can carry on working on research in tree diseases in the future, as this project has given me a real drive to continue in this important area. Sadly Louise is our third and final Oxford-Sylva Graduate Scholar, as we have been unsuccessful in fundraising sufficiently to appoint a new student. We are excited to announce that our first app is now live in the Apple store – the new AshTag app. 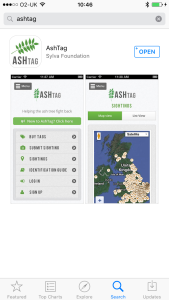 Following the transfer of AshTag to the Sylva Foundation from the University of East Anglia, which first developed the app in 2012, we have been busy updating the app in readiness for a new season of ash tree tagging in 2016 – hopefully with your help! We need to find ash trees across Britain that are tolerant to ash dieback. We expect that 2016 will witness the greatest spread of this devastating disease. 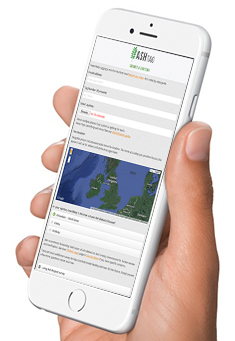 We offer the AshTag app to enable anyone to report on ash trees that are tolerant (to some degree) to ash dieback, caused by Hymenoscyphus pseudoalbidus – the fungus that causes ash dieback (formerly known as Chalara fraxinea). We are most interested in larger trees but any tree can be surveyed. We are just as keen to learn about diseased trees as healthy trees. We are particularly keen to survey ash trees in every corner of Britain, because the genetics of ash trees vary across the country. Ideally, the trees selected need to be surveyed every year for at least three years, so that a detailed picture of their health is built up. Ultimately, trees that appear to have some tolerance to ash dieback will be sampled by taking cuttings, and will enter a programme aiming to breed tolerant trees to secure a future for ash trees in Britain. We are working with partners the Earth Trust and Forest Research in this project, funded by Defra. 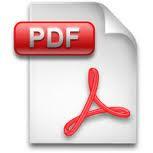 The survey consists of five questions and is simple to complete. To take part you can simply set up an account on the website, although using the app will allow you to enter information out in the field. If you would like to request a free AshTag pack, we have some limited supplies: apply here (if you have already requested a pack, don’t worry we have your name in our system). We are particularly keen to hear from those who run communities of volunteers (contact us). If your tree appears to be tolerant, in the future you may be contacted by a scientist from the Living Ash Project who may be interested in sampling the tree to enter it into the breeding programme. Last week volunteers got hands-on tagging ash trees in Cornwall; taking part in the Living Ash Project. The volunteers were supported by the Helping Hands for Heritage project, funded by Heritage Lottery, aiming to expand the potential of volunteering in the Tamar Valley Area of Outstanding Natural Beauty, where they are working towards protecting and caring for its remarkable natural and cultural heritage. Volunteers gathered at National Trust property Antony House to learn about ash dieback and how to tag ash trees so that the trees can be included in our collaborative research. All photos (c) Tamar Valley Area of Outstanding Beauty. The Living Ash Project needs more volunteers to help find ash trees that may have some tolerance to ash dieback, and to include them in a breeding programme to secure a future for this precious native tree species. We have a limited number of free ash tags to give away to individual volunteers, who can request these via our webform – click here. If you run a volunteer group that may be interested in getting involved, please contact Gabriel Hemery. Have you tagged your ash trees yet? Sylva is asking for help in adding ash trees to an important nationwide survey. We want volunteers to ‘tag’ trees and complete a simple survey online. We are asking members of the public to get involved by tagging up to five ash trees that will be surveyed once every year. Tag packs consisting of five tags have been developed, each with a unique identification number, plus aluminium nails to affix it to the tree stem (these do not harm the tree), together with full instructions. Once that the trees are tagged, we ask volunteers to complete a simple annual survey about its health. The survey is hosted by our partner Ashtag and is available online on computer, tablet or smartphone. Volunteers are asked to pinpoint the tree location(s) on an online map, take a photograph, then answer five straightforward questions. As Chalara ash dieback spreads across the British Isles, the Living Ash Project aims to identify and secure ash trees that show good tolerance to the fungus that causes the dieback (Hymenoscyphus pseudoalbidus) and use these individual trees as the foundation of a breeding programme. Partners in the Living Ash Project will be assessing the many thousands of trees that exist already in a breeding programme for ash, and we will use citizen science to screen the wider population – and this is where your help is needed. Later, we will produce trees that show good tolerance to the fungus, and plant them on the public forest estate as an archive, freely available to the forest industry. We will also develop techniques to enable us to rapidly produce large numbers of tolerant trees for reforestation. The five year project is funded by Defra. 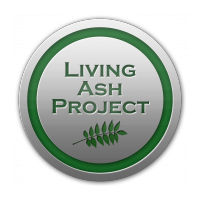 The Living Ash Project is asking members of the public to report information about the health of ash trees. They are especially interested in those that may have some tolerance to the disease that is threatening Britain’s second-most common broadleaved tree – Chalara ash dieback. The Living Ash Project aims to identify trees that are tolerant to ash dieback. There are an estimated 120 million ash trees in Britain’s woodlands and hedgerows. Evidence from Denmark, where Chalara ash dieback is more prevalent, indicates that approximately 1% of trees show good tolerance to the disease. 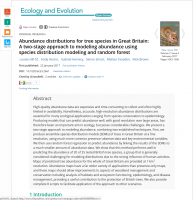 While tolerant trees may regenerate naturally in some woodlands, identifying tolerant trees is urgently needed so as to ensure a genetically diverse and resilient population for future woodland planting. Identifying tolerant trees and including their progeny in breeding programmes run by the Living Ash Project will enable the large-scale production of resilient trees. Gabriel Hemery, Chief Executive at the Sylva Foundation says: “The launch of this survey is a milestone in the development of the project. We will be working closely with AshTag to oversee the online survey and look forward to receiving submissions from members of the public”. He added, “Enabling people to follow the progress of an ash tree is very important, as it will allow us to understand the tolerance of a tree to this devastating disease”. The Living Ash Project team are most interested in larger trees but any tree can be surveyed. They are particularly keen to survey ash trees in every corner of Britain, because the genetics of ash trees vary across the country. Ideally, the trees selected need to be surveyed every year for at least three years, so that a detailed picture of their health is built up. People who want to find out more can visit www.livingashproject.org.uk to take the survey and to get free tags to track the health of their tree. Sylva Scholar Louise Hill – who is studying the consequences of Chalara ash dieback in British woodlands (read more) – is looking for woodland sites in the south of Britain where she could set up her experiments. If you are a woodland owner, perhaps you could help her? I am looking for areas of deciduous woods, with ash mixed in to it ideally at a density of around 300 stems/ha (i.e., not an ash monoculture). Within each site I want to set up at least one (ideally two or three) blocks of plots; each block will contain three plots of 25 x 25m, one of which will have 100% of the ash ring-barked, one 50% and on 0% (control). The experiment will look into the effects of loss of ash trees on growth rates of the remaining trees, recruitment of seedlings of other species (ash seedlings will be removed), and also effects on the ground flora. It will also look into any interactions with deer abundance for these effects. I am looking for sites in Oxfordshire, Dorset, Hampshire and the Isle of Wight. If you have a suitable site, and are prepared to have some ash trees sacrificed in this way, please contact Louise directly to discuss further. She can be reached at louise.hill@plants.ox.ac.uk. We are pleased to welcome back Robert Penn to Oxford on the 30th November for a seminar — 2013 – An Extraordinary Year for Britain’s Woodlands seminar — to be held at Oxford University’s Department for Continuing Education (OUDCE). Robert Penn is an author, journalist, TV presenter and cyclist. As a journalist, Robert writes for the Financial Times, The Observer, Sunday Times and Conde Nast Traveller, as well as a host of cycling publications. 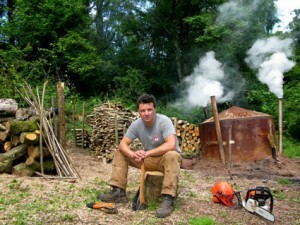 In 2012, Robert presented Tales from the Wild Wood, a six-part series for BBC4 about British Woodlands. Robert has kindly agreed to speak at our event this year. We look forward to having a preview of his new book – Touch Wood: the story of the ash tree, to be published by Penguin in 2014. For further information on the event on 30th November and to register please download the PDF or visit the OUDCE website. In the week that AshTag relaunched to enable citizens to report both healthy and diseased ash trees Chalara fraxinea or ash dieback, was discovered in a thirteenth county in England. The latest county, Dorset, joins Cambridgeshire, Devon, East Sussex, Essex, Kent, Lincolnshire, Norfolk, Northumberland, Suffolk, Surrey, West Sussex and Yorkshire. According to Defra the disease has now been confirmed in 557 sites including 198 locations in the wider environment. Chalara was discovered in England’s woodland last Autumn as a result of the intensive survey carried out of sites across the UK where ash trees are known to be present. It is also found in sites across Northern Ireland, Scotland and Wales, although most of these currently are on sites planted (unknowingly) with diseased trees in recent years. On a recent Good Woods visit to a woodland in south east England, a new case was discovered by one of our advisors. It had previously gone unnoticed by the owner, and only came to light during the visit as a management advice was being drawn up. The authors of The New Sylva have been searching, with help from readers of their book blog, for the best example of a venerable ash tree in Britain to feature in the book. Last week our artist-in-residence, Sarah Simblet, visited the chosen tree with co-author Gabriel Hemery. It is growing in the ancient deer park at Moccas in Herefordshire, among dozens of other ancient oak and sweet chestnut trees. The authors of The New Sylva are searching for the finest example of a common ash (Fraxinus excelsior) tree to feature in the book. They hope that our readers can help by submitting their favourite ash trees – one of which will be selected and appear in the book frontispiece. Following the outbreak of ash dieback (Chalara fraxinea), the chapter on Ash in The New Sylva has been rewritten (see post). Reflecting on the likely impact of the pathogen on ash trees in Britain, the authors are keen to feature a majestic British ash tree in one of the most prominent positions in the book; the frontispiece. There are many known venerable and notable ash trees in the country, and surely many more lesser-known trees. Can you propose a candidate ash tree? It could be especially grand or noble, simply have a beautiful and graceful form, have its own fascinating history, or be very ancient. It may be just your favourite ash tree. The tree selected will be visited by the authors some time in the next three months. 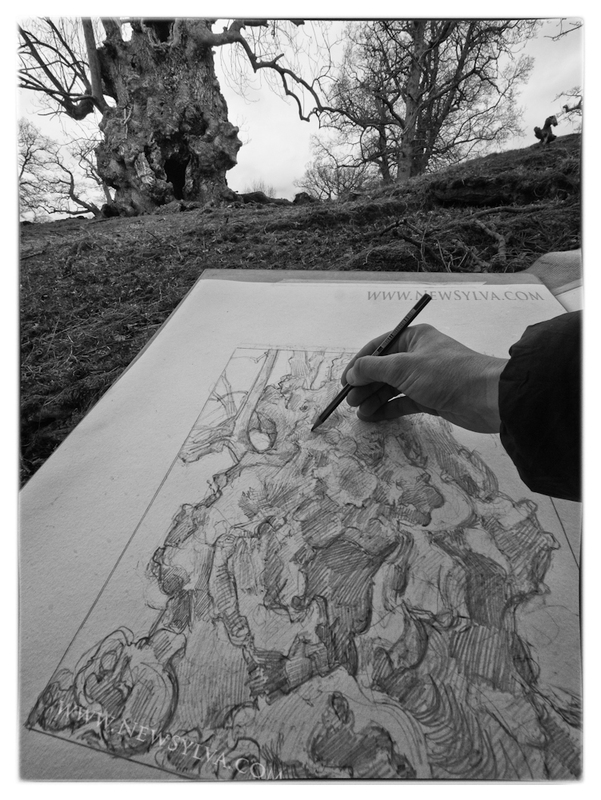 It will feature as a full page drawing made by Sylva’s Artist-in-Residence Sarah Simblet. Full acknowledgement of any assistance will be provided in The New Sylva.